Description: The Boring Log Form produces a boring log as a form embedded within EQuIS Professional. 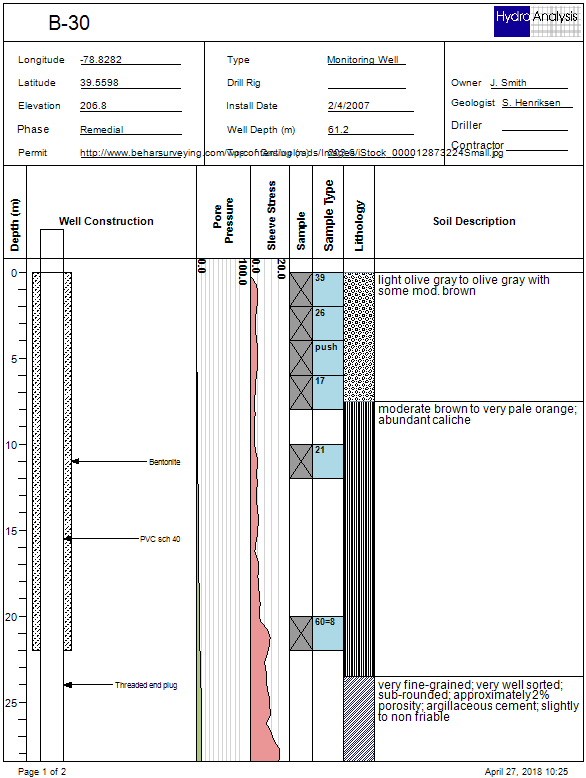 The boring log is generated using the EnviroInsite code. The form relies on a log design template file to describe the log content and format. The template should be created in the desktop application of EnviroInsite and imported into the EQuIS database prior to running the report. The contents of the template are stored n the DT_FILE table. Typically, template files are uploaded into the database using the Docs and Photos Form within EQuIS Professional. The FILE_TYPE field should be set to ".xml", and the file content is stored in the CONTENT field. To share the template between multiple facilities within a single database, the content of DT_FILE.FACILITY_ID should be set to null. Input Parameters: The following parameters may be selected from the standard EQuIS parameter selection interface. After the boring log has been generated, users may elect to double-click on the resulting log to display the boring log design template. The template may be modified to customize the log content and format. Documentation of the properties in the boring log property dialog box are contained in the EnviroInsite documentation in the Boring Logs chapter. Please be advised that each log requires roughly 30 seconds to generate. If the user neglects to identify locations or location groups, then logs will be generated for all locations, which could require a substantial duration. Select a template file from DT_FILE records for which the FILE_TYPE field is set to “.xml”. The template file describes the content and format of the generated boring log and may be loaded into DT_FILE using the Docs and Photos Form within EQuIS Professional. Select one or more locations for which logs are to be generated. Select one or more location groups for which logs are to be generated. Report Requirements: A local installation of EQuIS EnviroInsite 7 and a template file are required to run this export.